Progressive has released a new commercial starring Flo, aiming to highlight that Progressive will protect you 24/7. 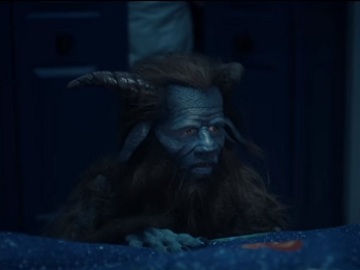 The 30-second spot, titled “The Closet”, features a boy calling his parents in the middle of the night, fearing that he might have monsters in his room. His father assures him that there are no monsters, but the kid is still scared. “But you said they’ll be watching us all the time.” – he says, remembering a conversation he had with his parents. “No, no, honey, we meant that Progressive will be protecting us 24/7.” – his mom answers, and his dad says they’ve bought an home and auto insurance to save money and there’s nothing to be afraid of. When the boy is trying to add something, pointing toward the closet, his father tells him “Good night!” and leaves. At this point, the closet’s door is opened and Flo shows up. “I told you I was checking the wiring.” – she tells the boy. A monster shows up, as well, from under the kid’s bed, saying “He’s never like this.” referring to the boy and finding also an explanation, related to something that happened at school. Progressive urges you to combine insurance for your car and property to start, then add more policies as needed, mentioning that you will get plenty of discounts for adding cars, motorcycle, boats or more.